Little known is the fact that all Microsoft Office programs include a password protection mechanism built right in, and Word 2010 is no exception: you cannot "password protect" access to the Word application itself (except by locking your PC), but you can add a password to any document you like. This will prevent access to its content to all but the most knowledgeable hacker - in other words, 99% people won't be able to see the text inside that document unless you give them the password to open it. Launch Microsoft Word, and open the document you want to password protect (or use a blank one). If needed, save any changes you made, and click on the "File" menu. Under Permissions (see screenshot above), click on "Protect Document". 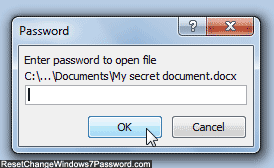 Select "Encrypt with Password", and the "Encrypt Document" dialog will open. Enter your Password in the field, and hit Enter - Word 2010 will open a similar "Confirm Password" dialog as soon as you do, to avoid any typo. Re-enter it and hit Enter once more. Hit Esc to return to your document: from here, everything looks normal, and you can resume editing it as you would any other Word document. After having saved any other edits, close that file (no need to exit Word itself). And from this point on, you will need to enter your credentials to view and/or edit this document; keep in mind that this is a basic implementation of authentication, and Word 2010 doesn't include features like session timeouts: if you leave the document open, anyone with access to your computer will be able to see it. To prevent others from seeing its content when you step away from your computer, either lock your Windows account (press Windows key and L), or better still, close the document in question! If you decide to make this document available to all, click on the "File" menu and select "Protect Document > Encrypt with Password". When the dialog opens, erase the current password and click "OK". Before you start worrying, Word allowed you do that because you had to know the password to get to that point. Follow this same procedure to change the Word document's password: erase the old password, enter a new one, hit Enter, and confirm the new one.